If football is a “funny old game” politics can be a downright hysterical one at times. The latest bit of funny business comes from Southport’s former Liberal Democrat MP, John Pugh. 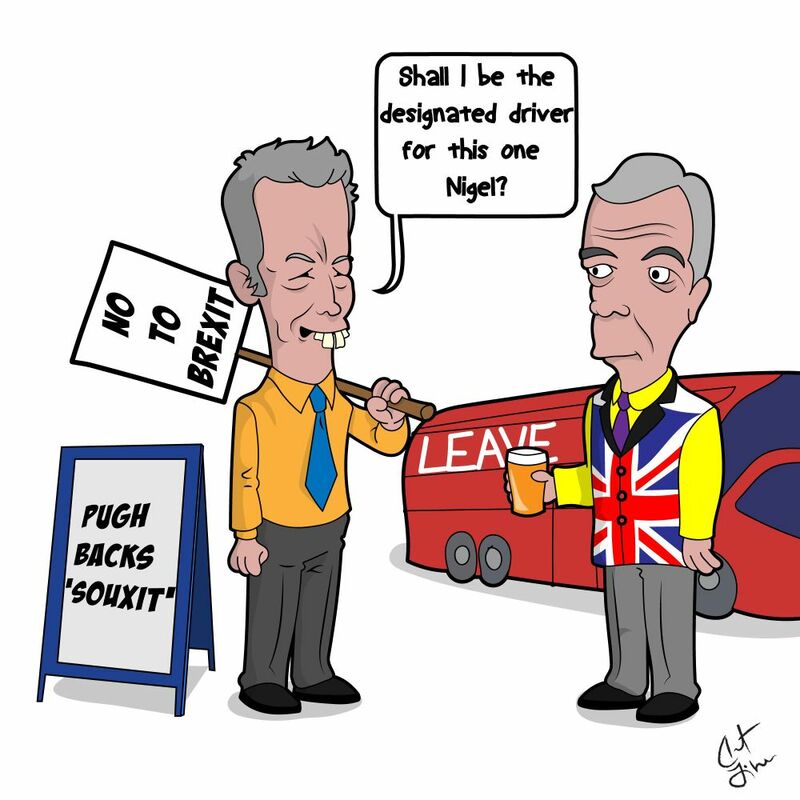 With more time for hobbies these days, Mr Pugh seems determined to become the town’s very own Nigel Farage by shouting long and hard, if none too coherently, for “Souxit” …Southport’s very own leave campaign. Trying to breathe new life into a long-corpsed idea, Mr Pugh asserts that Southport should no longer be part of Sefton Council. Nor indeed should it even be part of the neighbouring Lancashire councils. No, Sefton should apparently be split in two and Southport would essentially become its own separate unitary authority, with the other Bootle-based. It’s a rather low voltage proposal, however, for several reasons. Firstly, if Southport’s ‘voice’ is not being heard it rather begs the question what exactly are the town’s 20-odd Lib-Dem and Tory councillors doing? The criticism appears a tacit admission it’s not a lot that’s constructive. Southport’s Lib-Dem councillors especially have a reputation for opposing Sefton proposals in the town, such as the multi-million-pound redevelopment of Southport Market, while Labour-led initiatives such as the refurbishment of Birkdale village are given scant regard. That Sefton has invested nearly £100m in the town is also ignored in the Souxit narrative. It’s a dialogue however that others appear determined to drown out and prevent happening in whatever way they can. The most recent example is a story which Mr Pugh and Kew Ward’s Lib-Dem Councillor, David Pullin, put out to the local press loudly proclaiming “Lib-Dems Challenge Council Secrecy”. Proceeding to thunder along with the measured quality of an enraged bull elephant it trumpeted of things being “almost Stalinist” as it made claims of a cabal-like Labour-only secret meeting regarding a council acquisition. The problem for Messrs Pugh and Pullin is that not only is much of it incorrect says Sefton Council but also the leaders of the three opposition parties, including the Lib-Dems, actually took part in the acquisition discussions. A particularly liberal definition of “secret” then it seems. At the very least, the raising of the topic some three months after the meeting; just as Souxit touts its wares and attempts to lure unsuspecting passers-by with its breathy promises and also via the offices of its most enthusiastic salesman, Mr Pugh, could be seen as worthy of a quizzical eyebrow. Another reason that the Souxit proposal produces more heat than light is that the division suggested by the former MP appears based more on party politics and an attempted populism than it is on practicality. What Southport’s Lib-Dem and Conservative critics of Sefton fail to acknowledge is that it was their parties in government, firstly through coalition and then the Tories solely, that ordered a 51% cut in its budget. Like a Dickensian street gang, proponents of Souxit want to cut ’em and run, making off into the night with their spoils. Over £200m of funds lost between 2010/11 and 2017/18 is a simply huge amount which obviously then has a huge knock-on effect. To order those cuts and then criticise the council is akin to severely hobbling a horse and then complaining that it’s lame. Not unlike the call to ignore experts during the Brexit campaign, the proponents of a separate authority don’t really talk numbers though and with good reason, because here they just don’t stack up. On top of all those budgets cuts, they want to add the cost of setting up a completely new council. A unitary authority has a responsibility for over 1,300 statutory duties, creating a totally new body to carry those out would be hugely expensive. It‘s a double-whammy that would certainly hit Southport’s council tax payers hard. It’s estimated that their bills would rise by over 25%, something that Mr Pugh again tends not to highlight in his proposals. Significant central government funds would also have to be called upon, so no money being promised for the NHS by this leave campaign but possibly being diverted from it. The costs involved are just one of several huge hurdles that would have to be overcome at a time when local government is under more pressure than ever. Simply put, it’s a completely impractical proposal. So why is Mr Pugh now so vocally attempting to revive it? One possible reason is that this is little to do with what’s good for Southport and much more to do with what’s good for the Liberal Democrats in the town. This would also explain why Mr Pugh does not suggest Southport goes back into Lancashire but wants a totally new council created. After 20 years of returning a Lib-Dem MP, Southport comprehensively rejected them in the general election last month and they were also pushed all the way back into third place by a resurgent Labour Party. Southport Lib-Dems are understandably nervous that they will go the way of their colleagues in Sefton Central and become virtually extinct. By suggesting a separate authority the Lib-Dems are hoping they can create a power base and also re-establish themselves in the town. Mr Pugh claims he has cross-party support for the idea and reinforcing the impression of his going “full-Farage” he even appeared on the BBC at the weekend alongside UKIP’s parliamentary candidate in the town, Terry Durrance, with both calling for Souxit. That both parties are also rightly fearful of their highly precarious position in Southport is surely not just coincidence? The possible doubling of councillors in the town as a result of Souxit would be seen by both as offering hope for survival. How long then before Mr Pugh stands for election to the very body he wants us all to leave, or starts to pop up in the press doing his best man-of-the-people impression with pint in hand? We shall see. Next Next post: Jeremy Corbyn Visit Confirmed!